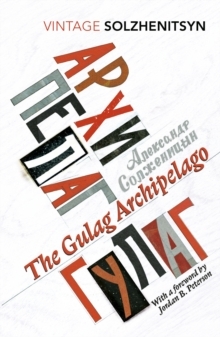 WITH A NEW FOREWORD BY JORDAN B. PETERSON'Solzhenitsyn's masterpiece...The Gulag Archipelago helped create the world we live in today' Anne ApplebaumTHE OFFICIALLY APPROVED ABRIDGEMENT OF THE GULAG ARCHIPELAGO VOLUMES I, II & III A vast canvas of camps, prisons, transit centres and secret police, of informers and spies and interrogators but also of everyday heroism, The Gulag Archipelago is Aleksandr Solzhenitsyn's grand masterwork. Based on the testimony of some 200 survivors, and on the recollection of Solzhenitsyn's own eleven years in labour camps and exile, it chronicles the story of those at the heart of the Soviet Union who opposed Stalin, and for whom the key to survival lay not in hope but in despair. A thoroughly researched document and a feat of literary and imaginative power, this edition of The Gulag Archipelago was abridged into one volume at the author's wish and with his full co-operation. '[The Gulag Archipelago] helped to bring down an empire.